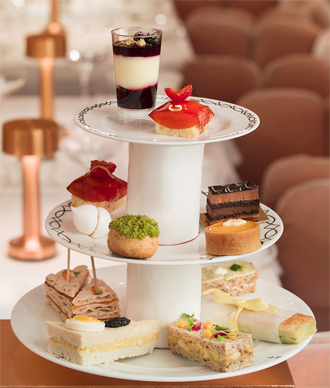 sketch London serves up a luxuriously chic afternoon tea, the décor and atmosphere as artful and delicious as the bubbles and bites. 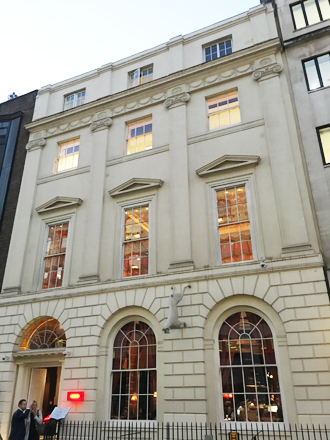 In the heart of Mayfair, amongst Vivienne Westwood, Dior and Jimmy Choo, there is one boutique venue which doesn’t have a store window to show off its delights. 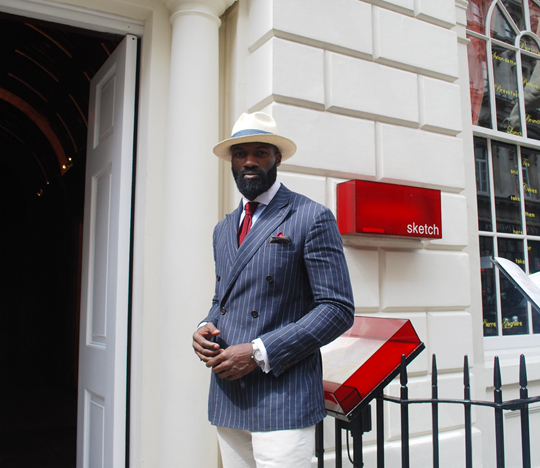 Instead, to entice you into sketch, is Charles the aesthetically delicious doorman. While I waited with an old friend for a new friend to arrive, Charles treated us to a game of hop sketch….well, hop scotch but I think allowances on the name must be made! 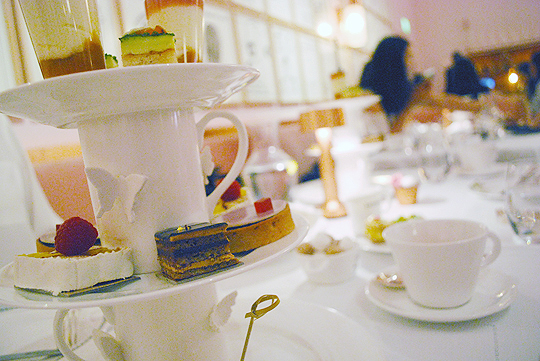 This fun, refreshing and delicious theme continued throughout our afternoon at this sharp and fashionable venue. It seems appropriate to set the scene: sketch was opened in December 2002 by French Michelin-stared master chef Pierre Gagnaire and restaurateur Mourad “Momo” Mazouz; their desire to create ‘a centre, a “lieu” or destination place, for food, art and music’. 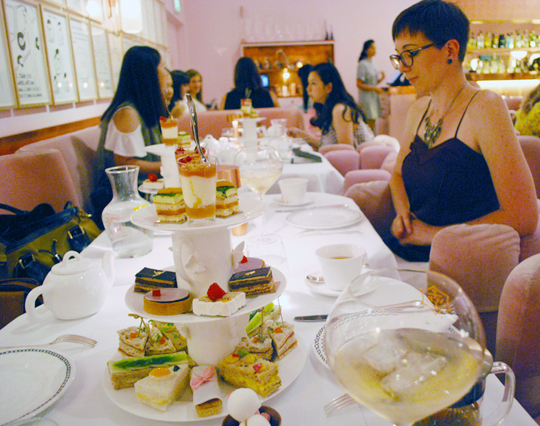 This 18th-centry townhouse serves afternoon tea during the day and cocktails in the evening, its phrase “Eat your Art out” perfectly describing the culinary exhibition space. I spent a good while devouring the interior design before the food was even brought to us. Each of the five rooms at sketch has a distinct look and The Gallery’s quirky elegance doesn’t disappoint; from the pink velvet chairs which look a little like a circle of lady fingers to David Shrigley’s 239 original framed prints on the walls, The Gallery is a room for artistic expression. The table itself, with the gleaming white and heavy linen spread across it like a blank canvas, is an extension of the exhibition space, with the tableware and food design illustrating the flow of creativity around sketch. We were welcomed to The Gallery by each and every waiter and waitress who walked past us with wide smiles and our waiter Jean-Francois explained the full menu with a relaxed charm and knowledge. 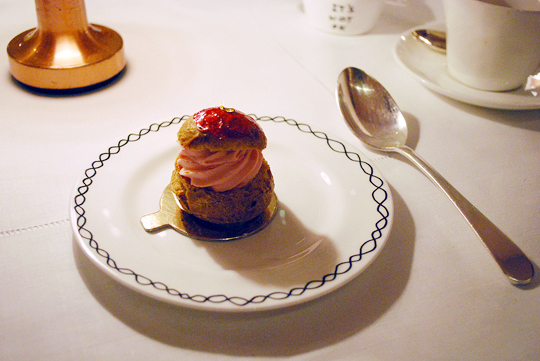 Then the small decision of which tea to accompany our food. There were 19 choices of tea available, including black, white, oolong, herbal, green and puerh teas, all with descriptions to help you choose. I’m English and a huge earl grey fan (I may even be verging on Lady Bracknell) and was delighted to use a silver tea strainer and spoon. The tableware was an artful touch – reaching the bottom of my cup, Shrigley’s words ‘forget about it’ reminded me that a good cup of tea can help you do just that. Pleasingly, they take their tea seriously here too. 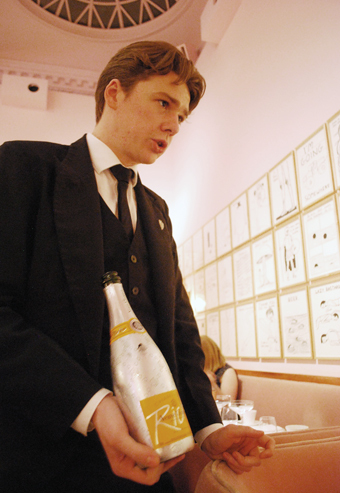 So seriously in fact they are willing to pour Veuve Clicquot through it. 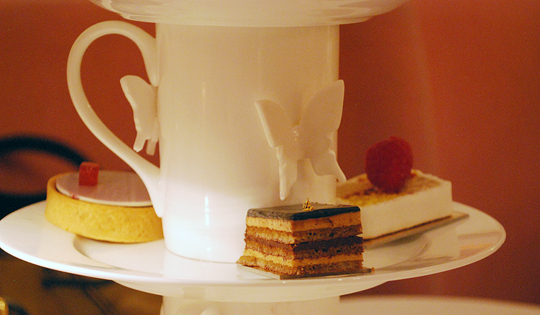 Poured through a small tea strainer, earl grey or vanilla infused Veuve welcomes those enjoying the champagne afternoon tea. 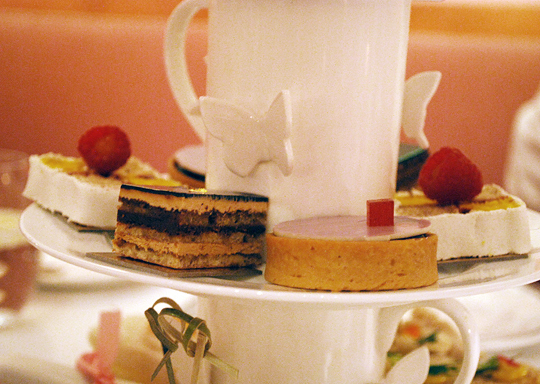 I’ve not experienced anything like that during an afternoon tea before and it really was a touch of quirky class. My friend and I tried the vanilla and it was exquisite (I know, I love earl grey, but too much of a good thing and all that). 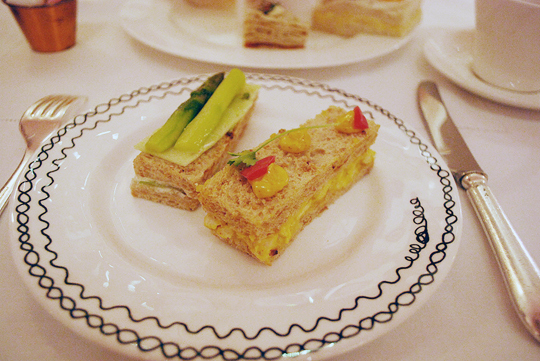 Quail egg and caviar and topped the egg and mayonnaise sandwich and the coronation chicken was lovely. We were encouraged to ask for extras of anything, so unusually for me I actually asked for another sandwich, taking up precious treat-space in my tummy. Absolutely worth it. Then of course the age old question of what type of scone. I personally like scones with sultanas, but plain ones were on offer as well, with fig or strawberry jam. The jam and cream portions were a little too small and we asked for several top ups to ensure we had enough, although sadly by the time the extra portions were brought over my scone was cold. It would have been nice to taste the fig jam on a warm scone but this was the smallest of niggles during the excellent afternoon. The cakes were just the right size between too little and too much, a satisfying two bites to enjoy the taste but still have room for more. Battenberg cake was given a stylish new twist and marshmallows, my childhood favourite, left the ‘80s and were brought racing into the C21st with a soft rhubarb flavour. We weren’t rushed during our two hour booking, and although the parlour was full and busy, the staff were relaxed and full of smiles. There is no gluten free option available. Sketch oozed modern class. Quirky yet chic, trendy yet with a nod to 1920s glamour, I felt like I was in Baz Lurman’s Gatsby. I wouldn’t have felt out of place wearing a feathered headband and Charleston dress while listening to the chilled out club tunes. 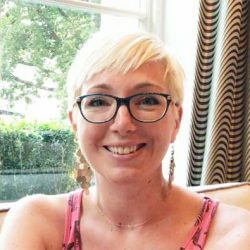 This was definitely a unique experience and I would fully recommend this to anyone looking for a luxurious treat or to celebrate a special occasion. I was once told that you can learn everything you need to know about an establishment through the presentation of the toilets. 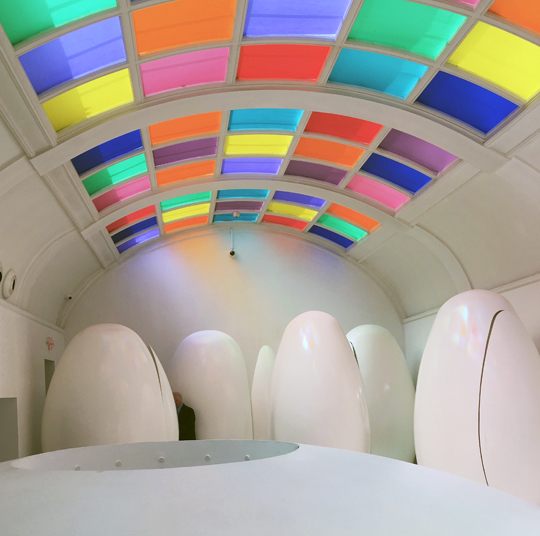 Put it this way – the toilets at sketch on their own are worth the visit! Space-like egg shaped capsules each with their own music or commentary; they were quirky, artistic and chic. 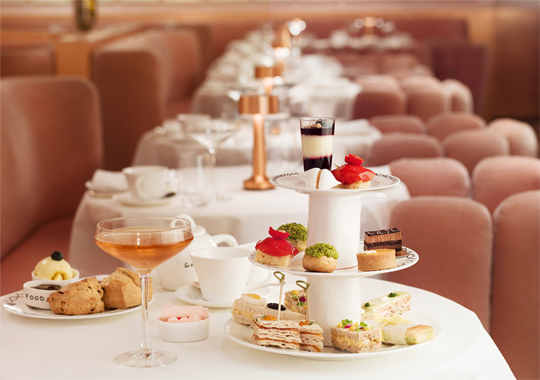 Just like the venue and the afternoon tea. From now on I’ll go straight to the toilets first! Tables available for two hours with a reservation between 12:30 and 16:30. Sketch is open seven days a week. Sittings: 12:30 – 14:30, 13:00 – 15:00, 13:30 – 15:30, 14:00 – 16:00, 14:30 – 16:00, 15:00 – 17:00, 15:30 – 17:30, 16:00 – 18:00, 16:30 – 18:30.